For the past several years, I�ve been walking around with a wallet that is actually the insert for a larger one. At first this was because wallets just seemed bigger than they should be, But over the years I realized that I�ve never found a wallet that really anticipates my behaviors well. For example, being able to reach into my pocket to get my driver�s license or cash without having to pull out the entire wallet. I�ve also never had a wallet in which I can hold business cards without mashing their edges. There are other issues, but those seem to rise to the top. In true Adaptive Path fashion, I decided it was time to do some rapid prototyping. I started with paper prototypes which I unfolded and used to create a fabrication drawing. I then sent it off to a leather guy to make a better prototype. Regrettably, the fabricator did not fully understand the project, despite lots of notation on the fabrication spec, and I got back something that was worse than my paper version. The dimensions were off and it was made from thick leather that made the wallet too big and stiff. The lesson I took away from this is that you should always try and make the prototype yourself if possible because you understand your goals better than you can possibly explain in a spec. So, I decided that I�d look into making a prototype that was better than paper, but which didn�t require special tools. That�s when the duct tape came in. I�d seen duct tape wallets before so I decided to try making one myself. I liked the basic design of the insert wallet I had, but it needed some adjustments. Below you can see images of my old wallet next to the prototype I created. I�ve only been using it for one day but I already know I�m heading in the right direction. I�ve turned up a couple issues that will impact my next prototype as well. Yay for prototypes! Let me know what you think! Old Wallet Inside View - As you can see the cash is simply folded in the middle which allows you to peel off bills like a bill fold. I used to use a bobby pin to keep the cash in, but ultimately found that it was unnecessary. Also, I liked being able to take the cash out of my pocket without the wallet (this requires that you put the wallet in your pocket with the open end up). Prototype Wallet Inside View - As you can see it�s very similar, though instead of using clear plastic that tears easily, I opted for triangular thumb pulls which make getting the cards out easier. Prototype Wallet Inside View Without Cash - same. Old Wallet Outside View - you can see here that the driver�s license is held on the outside, which I really liked. This way you can quickly reach into your pocket and pull out just the license. Prototype Wallet Outside View - I kept the license on the outside, but added a pocket on the other side for business cards rather than keeping them on the inside like in the old wallet. This allowed me to create a flap of material over the entire business card that keeps the edges clean (note that the pocket in which the license sits leaves the edge of the license exposed). My next version will add a thin plastic card over the business cards to protect them even more. 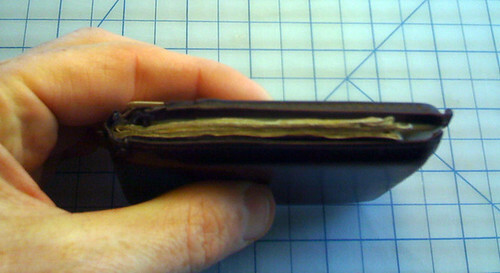 Old Wallet Side View - The old one was pretty thin, which I really liked. 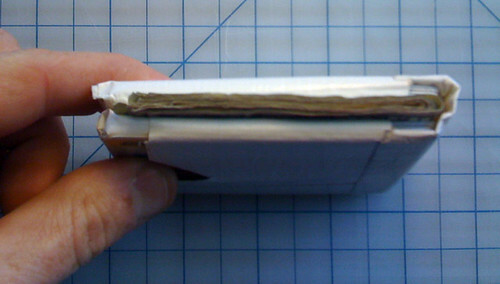 New Wallet Side View - the new one is slightly thinner because of the material used. Ultimately, I might have this fabricated from a thin, durable, and slightly stretchy cardura.